Inheriting all the excellent traits from the GoodWe ES series bi-directional energy storage inverter, the Goodwe GW3648-EM 3.6kW Hybrid Inverter is much more compact in size and weight, and is compatible with both on-grid and off-grid PV systems. 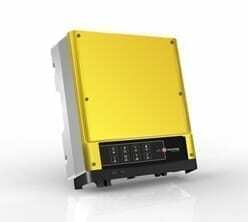 The Goodwe GW3648-EM 3.6kW Hybrid Inverter can control the flow of energy intelligently. During daytime, the PV plant generates electricity which can be provided to the loads, fed into the grid or charge the battery. The electricity stored can be released when the loads require it, for example during the night. Additionally, the grid can also be used to charge the storage devices via the inverter (UPS function). GoodWe (Jiangsu) Power Supply Technology Co. Ltd, is renewable energy enterprise located in the “Venice of the East”, a technology city called Suzhou. Since its foundation, GoodWe has focused on the technical development and manufacture of solar PV inverters and related monitoring solutions. All of the GoodWe inverters have been certified by CGC, CEI0-21, VDE, TUV, CE, G83, G59, SAA, EN50438, MEA, PEA and are listed by CEC from Australia, Western Power and Danish Government for universal applications in the corresponding regions and countries. Join our ZERO Home Bills Community. The BEST Battery Inverters from the BEST Brands at the BEST Prices available in your market on ZEROhomebills.com by Solaranna. All of the GoodWe inverters have been certified by CGC, CEI0-21, VDE, TUV, CE, G83, G59, SAA, EN50438, MEA, PEA and are listed by CEC from Australia, Western Power and Danish Government for universal applications in the corresponding regions and countries. GoodWe has been listed as “Advanced Technical Enterprise” by the local government, “Top 20 Chinese PV Inverter Enterprise in 2014” by PV365 Power Station Website, “Top 10 Chinese PV Inverter Enterprise” by Shine magazine, “Top 10 Chinese Solar Inverter Brand” by BJX magazine, “Top 10 Chinese Solar Inverter Brand” by PV CHINA, “SNEC MW Golden Award”. Join our ZERO Home Bills Community. The BEST Products from the BEST Brands at the BEST Prices available in your market on ZEROhomebills.com by Solaranna.